A Ready-To-Use Disinfectant Spray, Clear Gear Sports Spray is specifically engineered to protect today’s athlete. When used as directed on athletic equipment and in athletic facilities, Clear Gear Sports Spray kills infectious bacteria and viruses. In addition, Clear Gear deodorizes, cleans and is an effective fungicidal. 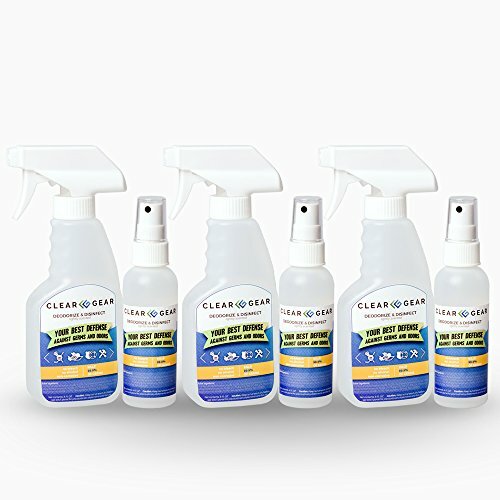 Clear Gear begins working immediately and kills a wide variety of germs including Staph, Strep and MRSA. Clear Gear is also effective against influenza, athlete’s foot, ringworm, mold and mildew. Disinfect your wrestling mats and headgear. Spray down all gym equipment and cardio machines. Disinfect and deodorize weights, dumbells, exercise mats, barbells, bands, jump ropes, treadmills, elipticals and more. Non-Corrosive to all gym equipment and Skin Safe! If you have any questions about this product by Clear Gear, contact us by completing and submitting the form below. If you are looking for a specif part number, please include it with your message.